A closer look at the home improvement giant's third-quarter results. Powered by a housing market that's gaining strength across the country, home improvement giant Lowe's (NYSE:LOW) third-quarter earnings results showed strong growth. Net income jumped 26% higher as profitability and sales both ticked higher. CEO Robert Niblock held a conference call with Wall Street analysts to discuss the retailer's third-quarter results. Here are a few key points he made in that presentation (all quotes are Niblock's). "I'm pleased that we delivered another solid quarter with comparable sales growth of 4.6% or 9.7% on a two-year basis." Lowe's enjoyed broad-based sales improvements, with each of its 14 geographical regions, and 12 of its 13 product categories rising, year-over-year. Yet Lowe's overall 5% growth again trailed larger rival Home Depot's (NYSE:HD) 5.7% gain. The difference was customer traffic. Lowe's transaction volume rose by 2.8%, which is a result that most retailers would kill for. However, Home Depot's traffic jumped even higher -- spiking by 4.4%. "Most encouraging this quarter is the desire to invest in home continues to grow, as survey respondents are indicating that growth in their home improvement spending is outpacing increases in their overall spending." Lowe's conducts quarterly surveys of its customers' sentiments, and executives have noticed a sharp improvement in their attitudes toward investing in their homes. "The number of homeowners indicating that their home improvement spending increased has almost doubled since 2012," Niblock shared. That report is backed up by hard data. Official statistics show that home improvement spending has jumped to over $600 billion per year from $400 billion per year in 2012. "Gross margin expanded 26 basis points and we effectively controlled expenses, delivering 130 basis points of operating margin expansion." Lowe's gross margin ticked up to 35% of sales, thanks to lower costs and the success of its seasonal product offering. That's on par with Home Depot's gross profitability, but the two companies' performances differ on net profits. 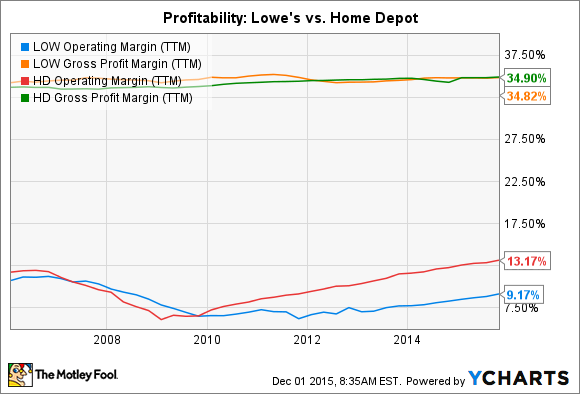 Lowe's 9% net margin significantly trails Home Depot's 13%. Still, Lowe's management expects its profitability to keep steadily rising this year as robust sales growth meets contained expenses. "Delivering our commitment to return excess cash to shareholders, in the quarter, we repurchased $750 million of stock under our share repurchase program and paid $260 million in dividends." Since it has a smaller store footprint, Lowe's typically spends more heavily on expanding its base. The company plans to open as many as 20 new locations this year, while Home Depot's base stays flat. Yet Lowe's profit gains still leave plenty of room for boosting cash returns to shareholders: Management has spent $3.4 billion on stock buybacks so far this year, up from $3.0 billion over the same time last year. And dividend payments are up to $700 million from $600 million through the first three quarters of 2014. "The forecast for key drivers of the home improvement industry remain conducive for growth at least through 2017. Steady job and income gains coupled with persistent home price appreciation and strengthening home buying should keep home improvement growth buoyant." Lowe's executives left their full-year growth outlook unchanged. They see comps clocking in at 4.25% at the midpoint of guidance, or just a tad below Home Depot's 4.9% target. Meanwhile, Lowe's 21% projected profit gain dwarfs its rival's 14% gain. But as Niblocks' above quote shows, both retailers aren't expecting the positive economic environment -- that's giving a huge boost to sales and profit growth -- to end any time soon.